This is a little overdue, but definitely something I wanted to write about since it's one of those relatively obscure topics that doesn't get talked about all that much. Have you ever heard the word "Intinction" before? It's a fancy-schmancy church word that refers to the practice of dipping Christ's Body (a.k.a. the bread) into Christ's Blood (a.k.a. the wine) during the Lord's Supper. Now, I haven't seen much about this practice posted online from a Confessional Lutheran perspective since it's not something that most of us within the Lutheran church have had to deal with let alone ever experienced before in our lives although it is the common practice with the Eastern Orthodox (and some Catholics) I'm told. Still, every now and then, a Lutheran church will flirt with changing its historical, orthodox practices of the Divine Liturgy for something "new and exciting" as their emerging and evolving doctrine (and desire to be "Missional" perhaps) influences their practices. Why was all of this on my mind enough to warrant its own blog post today? Well, because a few weeks ago, the nation bore witness to the nationally televised funeral service for one of our Supreme Court Justices. 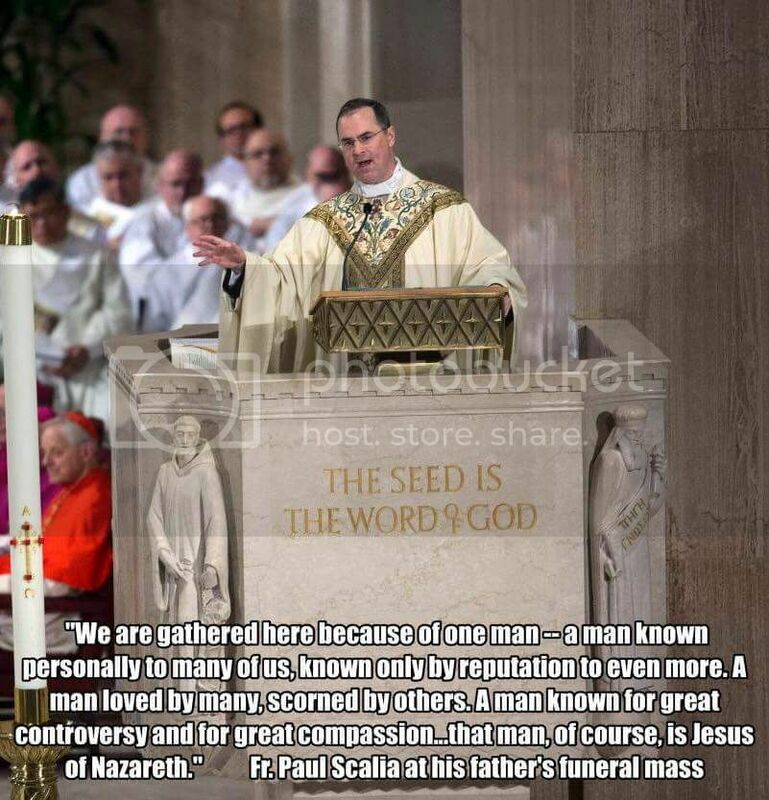 Scalia's funeral is a good lesson for us all. Our weddings and funerals are public witnesses to the world, and for some people, one of the few opportunities when they will enter a church and hear the Gospel of Christ Jesus our Lord. Let's make the most of these opportunities. Amen! This is most certainly true. For others like me, they are excellent teaching moments too! Living in an LCMS District where a majority of the churches here have marginalized the "Divine Liturgy" or "Traditional Worship Service" for the ever popular "Contemporary Worship (CoWo) Service," it was nice to be able to have most of Justice Scalia's beautiful funeral service playing on TV in the background with my kids (my son in particular) in the room. In fact, they were actually drawn to it and had many, many questions about what they were hearing and seeing since they obviously aren't exposed to that on a weekly basis (despite the fact that we attend one of the more faithful and liturgical Lutheran churches in the area). Again, I'm very grateful for such an unexpected opportunity to catechize them this morning! For instance, my 10-year old son commented on the practice of "Intinction" he saw during the Lord's Supper: "Why are they dipping it!?! You don't dip Christ's Body into His Blood like you're at a party or something!" Thanks be to God! I almost fell off the couch and marveled that he not only picked up on that, but that he said what he said about it too! Hmm...and there are many "leaders" in Christianity today who insist that young children cannot possibly understand the simple truths found in the Holy Bible or the simple practices derived from those simple truths practiced in Christ's Church. Anyway, it led to a good discussion about how doctrine (the unchanging Word of God and, in this case, Jesus' very own words about the Sacrament of Holy Communion) always determines what we are to believe, teach, and confess, and that doctrine always informs what we are to practice in His Church. To put it another way (or the way I tried to explain things to him), there's a good reason why we believe certain things and why we do certain things differently than other Christians do. That reason is only ever because of what God's Word clearly and plainly says to us. 2 Timothy 3:16-17 (ESV) "All Scripture is breathed out by God and profitable for teaching, for reproof, for correction, and for training in righteousness, that the man of God may be complete, equipped for every good work." It's all there in black-and-white on the page for each and every one of us to read. It's all there in the Body and Blood of our died and risen Lord and Savior, Jesus Christ, that we receive at the altar for the forgiveness of our sins and for the strengthening of our faith in these unchanging truths. As a husband and a father who often struggles with doubt as to whether or not I'm "doing enough" to catechize my family here at home as I should, I don't think I'll ever forget that particular Saturday morning and the conversation I had with my son! Isn't it quite telling how a mere child barely older than 10-years-old can understand the simple truth that he has been already been taught to accept by faith and trust in God's Word so much so that he can use that foundation to then analyze, observe, and question anything and everything he sees in the world around him that stands in stark contrast to such core beliefs, teachings, and confessions? Praise be to God! And yet, men much more learned than him, and perhaps even trained at Seminaries, prefer to make things much more complicated by taking any opportunity they can to question the Word of God instead, and by stretching it to mean something it doesn't. One of the best commentaries I've found on this subject from a Confessional Lutheran perspective was a piece written by Pastor Lincoln Winter published only a few months ago in December 2015 in which he writes that the practice of Intinction is disturbingly "a practice that has received much wider acceptance in our synod." In the West there is a tradition going back nearly a millennium that only the clergy receive the blood of our Lord. This, despite our Lord’s clear command “Drink of it ALL OF YOU.” No matter how clear the command of Christ may be, there will be some who refuse to follow that command. Early church sermons often commend the people for esteeming Baptism so highly, but then warn that they are esteeming it so highly, they are reluctant to actually undergo baptism themselves. No. Just, No. Worse yet, after the Koinonia Project, it was reported to us that the Council of Presidents had a service of the sacrament where Intinction was the only method of reception offered. Some district presidents refused to receive it under these circumstances, and much discussion ensued. That this was even possible means that our synod officials are either unaware of the synod’s scriptural position on the issue, or they are aware, but unwilling to follow it. I am told that the issue has been sent to the CTCR for consideration. Since the CTCR is, like all other boards and officers, subject to the synod, I don’t know what conclusion they can come to, other than the conclusion the synod reached in 1944: “Intinction would be a direct violation of the words of institution.” Perhaps they can explain it in a way that will winsomely defend the clear command of our Lord. But they dare not add confusion where our Lord has made things clear. And this is the real problem with Intinction. It muddies things; mixes that which our Lord has made distinct. It makes uncertain the proper reception of His body and blood, just as surely as withholding the cup from the laity did for a thousand years in the Roman church. Yes, there are hard cases: Alcoholics, specific allergies, etc. Those are the result of sin. In the case of alcoholism, it is the specific prior sin of the communicant. Allergies arise because of our general sinfulness in this world. But what of it? He has said that this is for my good. Do we trust His word, or do we doubt? Baptism might make a baby cry. I might slip on the ice and break my arm walking into the church. I should not for those reasons stop baptizing babies, or stop attending church for six months a year ‘just to be on the safe side’. The command of Christ is clear. Two things: (Body, Blood) Two actions: (Eat, Drink.) But where God has spoken there is no adiaphora. And that’s the challenge. On the one hand, some are saying that it is adiaphora, covered under the freedom of the Gospel. After all, God didn’t say not to do it that way. And yet, the very command “Take, eat” “Drink of it all of you” excludes all that is not eating and drinking. For this reason, we have also rejected Rome’s practice of withholding the cup from the laity, even though we have no compelling medical reason to argue against their claim that flesh always includes a certain amount of blood. That may be true. But Jesus said, “Eat… Drink”. He did not say, “Eat my flesh, and in eating also receive the blood.” Neither did he say, “Dip, mix, and consume both at once.” To fulfill the command of our Lord, we must eat and drink. And if we aren’t doing that in our Life Together, it really does call into question whether we are agreed on Augustana Article VII, “The Church is the congregation of saints, in which the Gospel is rightly taught and the Sacraments are rightly administered.” If the sacrament is administered in a manner that directly violates the command of our Lord, is it rightly administered? If we answer that it still could be, our Lord’s Words become optional – with no real authority, and therefore of no real effect. If we say that it is not rightly administered under those circumstances, then we no longer have a church agreed on the Gospel teaching and Sacramental administration. Which is to say, we no longer have the “true unity” spoken of in Augustana article VII, which depends on “the doctrine of the Gospel and the administration of the Sacraments.” We can talk all we want about our common doctrinal subscription made in our ordination vows. We can send out missionaries to the four corners of the globe. We can give away thousands of cows, or have millions of dogs visit the sick and infirm. But if we do not follow the word of Christ, we do not have the God-given unity that is the blessing for those who hear the Word of God and keep it. Which is to say, we are no longer “Church” in the biblical and confessional sense of the term. He's absolutely right in all that he wrote. In fairness, however, I should also mention that others have pointed out that the "official" position of the LCMS seems to contradict these points (or at least leave the debate open and unresolved). Regardless, I hope that I have adequately shown that Intinction is not something that we should be practicing in our churches whether Lutheran or otherwise, because it is not Biblical whatsoever. Now, as thankful as I was to have been given the opportunity to have this unexpected conversation with my son several weekends ago, we need to keep in mind that the doctrine that informs the practice of Holy Communion in the Catholic church is one of the major stumbling blocks between us and them, and I simply must add a few words about that here before wrapping things up. It’s important to view the Sacrament rightly. The Roman Catholic understanding of the Mass is that it is man’s sacrifice to God, man’s work done for God to merit the forgiveness of sins. But the Lutheran, Scriptural teaching of the Mass is that it is entirely God’s work done for us. We are on the receiving (the “drinking”) end, not the giving (the “pouring out”) end. Christ did not set up another Law in this Sacrament, as if, by our meticulous obedience, we earned his forgiveness, or as if, by our failure to observe the non-essential details of the institution, we incurred His wrath. “Christ is the end of the law so that there may be righteousness for everyone who believes” (Romans 10:4). The only “service” we render to God in the Sacrament is the worship of faith – faith in his words that we are truly receiving his body and blood for the forgiveness of sins. By faith in Christ, who did all things in the right way for us, we are rescued from the burden of having to do the right things in the right way in order to become righteous before God. ... We are not minimalists in the Lutheran Church. We don’t ask the question, “How little do we have to do to get by in following Christ’s words and institution in order to have a valid Sacrament?” Instead, we simply stay as close to his words as possible, and rejoice in the blessings we receive through them. ... In all honesty, the past 50 to 60 years have largely been an era of “experimentation” for Lutherans in the United States, an era in which the historic practices of the Church have been downplayed, criticized, and, in many cases, abandoned in favor of “trying something new,” either to “blend in better with the culture” or to be more “pragmatic,” or simply out of boredom with traditions they never understood. This infatuation with innovation has affected Communion practices, worship practices, and evangelism practices, to the point that even our very theological underpinnings are jeopardized. More often than not, the wisdom of our elders has proven to be wiser than our presumptuous innovations. We shouldn’t have been so quick to assume that we were wiser than the Church that has gone before us. Bottom line? In light of all these important points concerning the Lord's Supper, I thank God for giving my son the eyes to see the truth so clearly at such a young age. May He impart to each and every one of us the very same measure of grace and godly wisdom. In a Lutheran layman's terms, this is why doctrine matters, because doctrine always informs practice, and practice reinforces what we actually believe, teach, and confess.